In 1890, Poincare determined that trajectories of three-body systems are commonly non-periodic, i.e. not repeating. 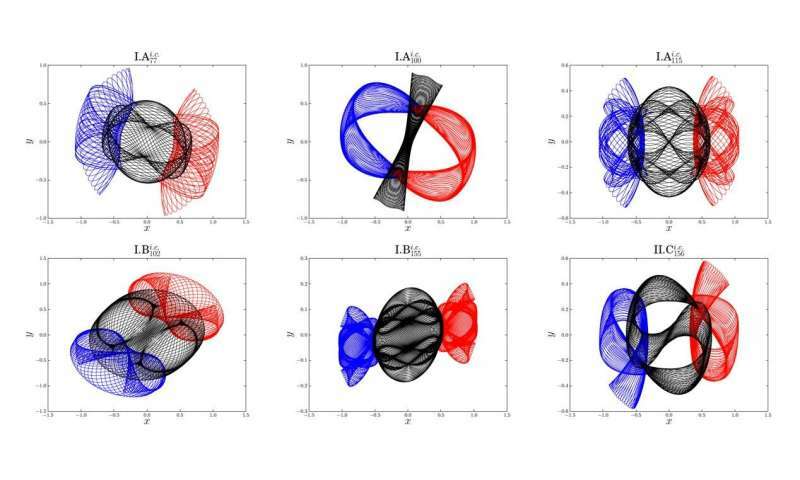 This can explain why it is so hard to obtain the periodic orbits of three-body systems. In the 300 years since the three-body problem was first recognized, only three families of periodic orbits had been found. In 2013, Suvakov and Dmitrasinovic [Phys. Rev. Lett. 110, 114301 (2013)] made a breakthrough, finding 13 new distinct periodic orbits belonging to 11 new families of the Newtonian planar three-body problem with equal mass and zero angular momentum. These 695 periodic orbits include the well-known figure-eight family found by Moore in 1993, the 11 families found by Suvakov and Dmitrasinovic in 2013, and more than 600 new families reported for the first time.